Whopper's Bunker: Somali Pirates will soon find themselves in hot water! Somali Pirates will soon find themselves in hot water! The Office of Naval Research has conducted a successful test using a High-Energy Laser [HEL] to disable and ignite a small craft in water off the coast of California. While similar systems had tested successfully on land, moist sea air presented an additional problem as it reduces a later beam's power. 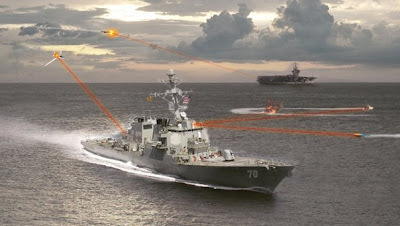 Now the U.S. Navy think that ship-borne lasers could eventually be used to protect vessels from small attack boats. Scientists have recently developed solid state lasers that combine large numbers of compact beam generators, similar to LEDs which have replace the outmoded technology of chemical-based weapons that expend toxic gasses. Until now, much of the development of HELs has focused on shooting down missiles or hitting land-based targets but according to the ONR's Peter Morrison "This test provides an important data point as we move toward putting directed energy on warships but there is still much work to do to make sure it's done safely and efficiently." The presence of UNETIDA's Director of Research and Development Dr. "Quantum" Pataal was noted at the test. Dr. Pataal was asked if UNETIDA may have contributed to solving the Navy's problem of using lasers at sea by offering advanced technology "acquired" from "elsewhere". The scientist dismissed the notion as "preposterous" before vanishing in a flash of light moments later while muttering to himself in Hindu. The laser test was carried out by the Navy and Northrop Grumman as part of a $98 million contract.